Now! That’s What I Call… The Original! 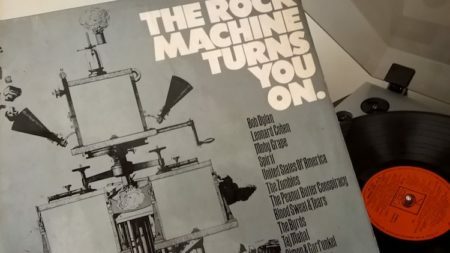 The Rock Machine Turns You On is the first bargain priced sampler album, released in 1968 to promote the Columbia Records (then known as CBS outside the US) catalogue to the long hairs in Europe, Australasia, Canada and South Africa. Priced at 14s 11d (about 75p) it cost less than half the price of a proper elpee in those days and is thought to have sold a cool 140,000 copies, enough to earn it the number 18 spot on the Albums Chart and play a large part in establishing the likes of Leonard Cohen (represented by Sisters of Mercy) and Spirit (Fresh Garbage) outside their native US. Minds drift as The Byrds weigh in with Dolphins Smile and The Zombies add the always-essential Time of the Season; while the blues end is held up by Taj Mahal (Statesboro Blues) and The Electric Flag (Killing Floor) with Mike Bloomfield in blistering form before the band’s drug-stained disintegration. As a sampler, The Rock Machine Turns You On does exactly what it should – it samples.